Charming Private Getaway Nestled in Trees; Close to Town! 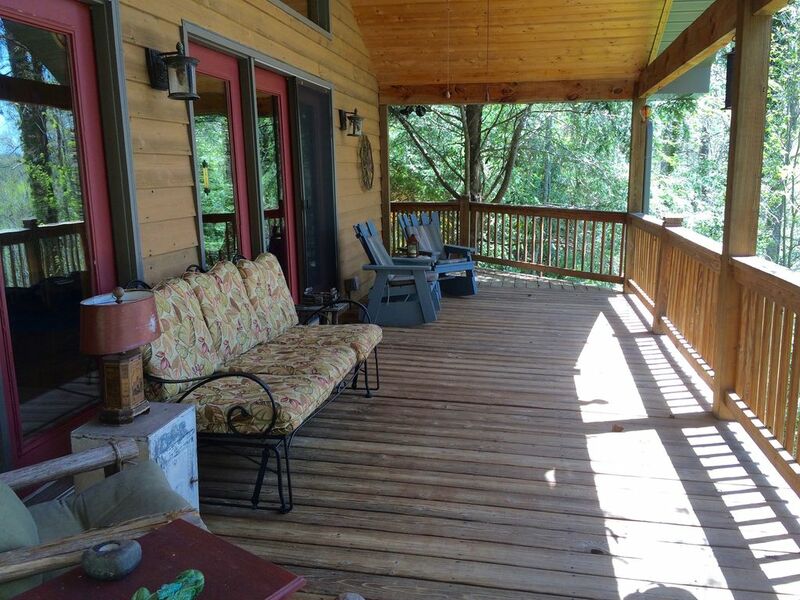 Cozy and spacious two-bedroom, two bath cabin tucked in the woods offers great privacy, yet less than two miles from town with its unique shopping and dining. Summer and fall surrounds you in trees, spring offers ridge views, and always the sounds of a waterfall on Mirror Lake as you relax on the large wrap-around covered deck. The cabin has a lot of natural light and features a natural stone gas fireplace, fully stocked kitchen, large master suite with queen bed and private bath, and comfortable guest bedroom with queen bed. The deck has many chairs and a glider on which to lie and read or take a snooze. Because the deck is covered, you can even sit and enjoy the rain on a summer afternoon. This cabin offers high speed wireless internet, 32" Smart TV w DVD/Blu-ray player, CD player, radio and device docking options.